We expected it to be something that was some kind of ancient Chinese art-form, Buddhist practice, or something of that nature. But research seems to suggest that that is not the case at all. 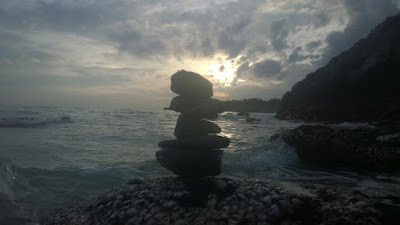 And while it seems likely that throughout history, all over the world, people have balanced rocks one atop the other, for whatever reasons drove them to do so - the art of Rock Balancing in its increasingly established current form, appears to be something quite new. Similarities have been drawn to such things as “Cairn”, and “Inuksuk”, man-made piles of rock with much longer histories. However, these structures usually served as landmarks, and were intended to stand for a long time. Whereas Rock Balancing is considered to be a transient art-form, with sculptures having life-spans often counted in hours, or even minutes. The name of the art-form, “Rock Balancing”, is not unlike that of the “Handpan”, in the sense of being quite a practical moniker, that barely hints at its potential for creating truly intricate-beauty. And in much the same manner that those hearing the Handpan for the first time are often deeply surprised that that wok / trash-can looking thing can produce the sounds that it does, the art of Rock Balancing requires a certain degree of sensitivity, with the ultimate goal being to generate that which appears to be impossible, but is in fact, only improbable. And even if like ours, your own initial attempts are not overly elaborate (see our first effort below), there is something quite "Zen" about the whole process (in terms of being present in the moment), and also something quite satisfying, in successfully stacking even only a small handful of rocks, and stones, to create something, that no matter how short-lived, and volatile, briefly adds a little extra wonder to the world. Before once again being consumed and set-to-purpose, by the appetites of Mother Nature.